Erin Gleeson is a popular US food blogger whose first book, The Forest Feast — celebrating her food and way of life at her country cabin just outside San Francisco — became a New York Times bestseller. This second book takes Erin's emphasis on simplicity, fresh ingredients and great flavours and gives it a fun spin for kids. The result is a collection of vibrantly colourful vegetarian recipes that are quick to make and should inspire even fussy eaters to get creative in the kitchen. A few pages at the front of the book clearly explain the basic cooking terminology, the measurements used and the kitchen tools required. Simple techniques for cutting vegetables are also illustrated. Then it's onto the chapters: Snacks, Drinks, Salads, Meals, Sweets, and Parties. So far, we've tried Apricot Bites, Potato-Green Bean Salad and the Blueberry Sparkler, and they've all been easy to prepare (minimal supervision of my eight-year-old required) and delicious. Keep in mind that this is a US publication, so some 'translation' is required — 'cilantro' to 'coriander', for example — but metric measures are given throughout. 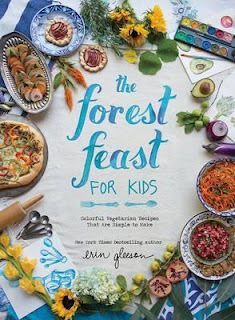 Erin Gleeson is a talented artist and photographer, so The Forest Feast for Kids is also visually gorgeous, with full-colour photographs and delightful illustrations throughout. Highly recommended, whether or not your family is vegetarian, as a great way to get your kids involved in preparing some easy tasty meals!